OGDENSBURG -- A city resident is being held on three felonies stemming from a Wednesday burglary at United Helpers. Early on Wednesday, police say they received a report of a suspicious man, and they say they later found him in possession of a snowblower. 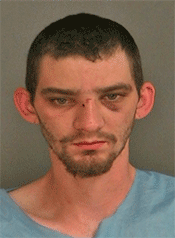 He fled, and officers chased him, according to city police. He was “quickly taken into custody without further incident,” police said. Police say the snowblower was stolen from a shed at United Helpers, 732 Ford St. They say on Wednesday afternoon, they received another report that the main UH office building had been burglarized and unspecified items were stolen. “The Ogdensburg Police Department would like to thank the neighborhood for being observant and calling in this suspicious matter,” police said in a news release. Lawton was being held pending arraignment, police said.